When tackling the streets of London, one must be ready to walk and shop till you drop. That is why it is of the utmost importance that you have all your essentials by your side for all your daily excursions for the duration of the trip. I’ll outline what accessories are best to help you port around all your items around the city in the most elegant, yet comfortable fashion. As one of the most iconic attractions in all of Britain, Big Ben was the first stop on my trip to London. With that said, it was also thousands of other tourists first stop. The hustle and bustle of the streets made it hard to keep track of all my belongings, so the key to not losing anything is having a reliable and secure bag with you. I was grateful for my Naples Traveler’s Backpack from Ashlin. This bag not only kept all my belongings organized and safe, but it made it a joy to carry with the adjustable and padded shoulder straps. It was also able to hold my bulky camera, makeup bag, laptop and more. With my trusty backpack, I was able to enjoy the beauty of Big Ben and snag a couple pictures of it while I was basking in it’s glory. Thankfully, I did this all without losing a single thing, which was an accomplishment for me since I can be quite absent minded and forgetful. Big Ben was definitely a highlight of my trip, and I would adamantly recommend that everyone see it at least once in their life. While trying to navigate through London, I stumbled upon a beautiful garden while on my way to lunch. I couldn’t resist taking a stroll through this breathtaking oasis, so I began to chart a new path. I crossed over a bridge that was overtop a lake, and began to gawk at the breathtaking view of the London Eye and numerous magnificent pieces of architecture, when I saw hoards of people walking past the bridge and down a brick road. My curiosity got the best of me, so I began to follow the crowds of people. I turned onto the brick road and in front of me was a palace that looked all too familiar: Buckingham Palace.Which meant that the beautiful park I had been in was St. James Park Lake. I do the most basic tourist thing possible and reach into my trusty Ashlin backpack and pull out my camera. I begin snapping photo after photo of the palace and the guards wearing their ridiculously large bearskin hats. 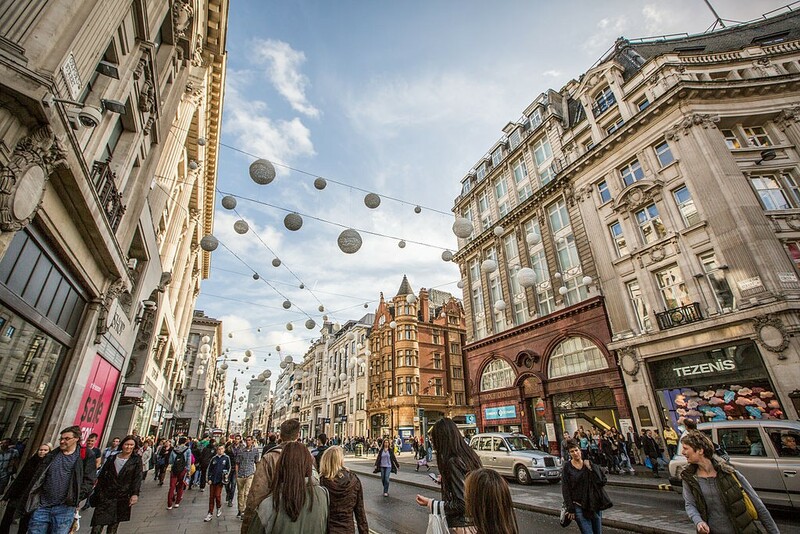 If you are even minutely interested in fashion, then Oxford Street is the place to be. With the latest trends and the greatest stores, it is imperative that you schedule this street into your trip to London. The phrase “shop till you drop” took on an entirely new meaning after a day of walking up and down this street, stopping at every store and combing through every rack. From Topshop to Marks and Spencers, I flew through the aisles, spending a small fortune on all the goods I purchased. After one afternoon, my arms had no more room for bags, so I had to begin stuffing my bag with all the things I bought. Thankfully, my bag was able to contain all that I could not carry, but I think next time, I’ll bring a suitcase to accommodate all of my purchases.